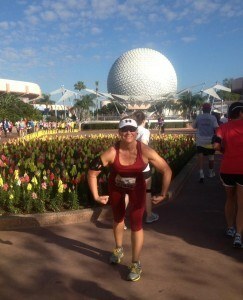 I am home from Goofy's Race and a Half Challenge. This is my race report and in the coming days and weeks I'm going to recap some tips for the race, what I loved, and other lessons learned. Today I'm just talking about my experience. In case you don't know, Goofy's Race and a Half Challenge is a half-marathon on Saturday and a full marathon on Sunday. The weather was GORGEOUS if you weren't running it. Temps reached low 80's with good humidity both days. I was so nervous because I've trained in the cold months and loads of sweating has been tough for me in the past with cramping. The few days leading up to the race I was SICK. Running a fever, severe body aches, and just no appetite. I told myself if I can't do anything but eat a little then it better be carb-tastic. From Tuesday until race day I ate toast, oats, sweet potatoes and Pop Chips. I was able to tolerate fruit so I did that, too, but I really just stuck with all of those. There was a lot of Fat Girl Thinking going on because I was just swelled up from being sick, on meds, trying to hydrate, and eating no veggies or meat. I also got stopped up downstairs so my tummy and everything was blowing up - scale, fingers, belly, nerves! My family arrived in FL and I was tired but feeling good on Thursday. We hit the pool that afternoon and relaxed. The next morning the Goofy's Race and a Half Challenge Expo was on day two but Chris was feverish and had a sore throat! Oh NO! Logan hung in there like a champ because going to a park that day was out of the question. We ate breakfast watching the ducks and birds and waited on my running partner to arrive. Kathy and I headed to the Goofy's Race and a Half Challenge Expo while Logan played in the room with a sick daddy. The expo would have been horrible for him...long lines and people just everywhere. If you have ever been to a Rock and Roll expo you don't need to go to this one. It's the same stuff and they were OUT of Goofy gear. Boo! After the Goofy's Race and a Half Challenge Expo/Packet Pick Up, Kathy and I took Logan to the pool for the rest of the day for swimming, hot tubbing, and sliding. Chris slept and and we picked up some dinner then we ALL went to bed. 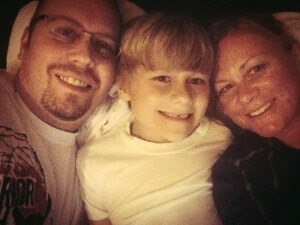 Even though Logan wanted to stay up he was sweet to just be quiet and play on his IPad until he was tired. At 2:45 am our feet hit the floor and we were out the door eating breakfast. Our fridge in the room FROZE everything so our oatmeal was crap. We checked our bags and lined up. The race went well although we got trapped behind a ton or walkers on narrow paths. 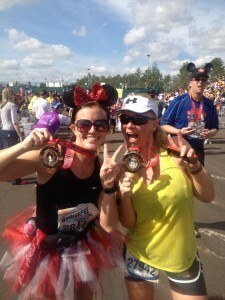 We got pictures and enjoyed running and weaving the walkers through Disney and Epcot. 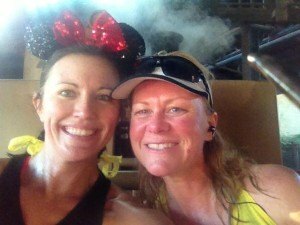 We KNEW, though, at the end we were going to sweat to death the next day of the Goofy's Race and a Half Challenge. At the finish it was so HOT and on Sunday we would only be halfway through. And, as many of you know, I'm not a chatter when I run but today we talked the whole time. We just had fun. I sucked down NUUN tabs on Saturday and we hung at the pool with Logan. He went to Animal Kingdom that morning with Daddy who wasn't 100% but felt good enough to take him to the park for a few hours. Logan loved the park for about three hours then he wanted lunch and swim time. Not your typical Disney family but it worked! He had a blast the way HE wanted to and even though it's expensive to not "stay all day" he got what he wanted out of it and we didn't have an over-tired and wore out kid! We went to bed early AGAIN for our 2:45 am wake up call. We changed our breakfast up a bit and were on our way. We started to get scared at the start we wouldn't make the cutoff time for the Goofy's Race and a Half Challenge. The heat was BAD the day before and they were expecting a lot of people to suffer Sunday. I think we sort of got quiet and just knew we had to do this. We've come too far now! Kathy took the lead which I'm glad. We do a run three minutes walk one minute interval. I was in charge of keeping us on track and she set our pace. For 90% of the race she ran ahead of me and I just followed. There's a lot to see and we got some cute pictures, but I honestly loved not talking. 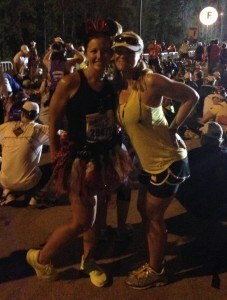 It was perfect and why she makes such a great running friend. She's chatty when we need it and she's quiet when it's just game time. The first half of the marathon went well. We were faster than the day before mainly because we didn't have the walkers to deal with like Day One. The second half was hard. Really hard. It was smoking hot and most of the time you are on back roads and asphalt. We did stop for a few pictures and the BEST part of the race was when we stopped to ride Mount Everest. If you were a runner you got a fast pass. It took seven minutes but totally re-charged us. Then we hit around mile 18 and it was just brutal. We were on a highway, it was so stinking hot, my feet were killing me and all I wanted to do was start bitching. We had an original pact that we couldn't complain until mile 25. We re-tooled the plan and I could start it up around mile 22 on "bitching bridge". That's when my brain was like let's just get this over with. I complained a minute and we just kept moving. My personal promise to myself was to keep the walk/run intervals as long as possible. As bad as I wanted to walk because my feet were just killing me I couldn't stand the thought of being out there any longer! We kept the intervals the whole time outside of pictures, eating, water stops, or applying 30 coats of Biofreeze. 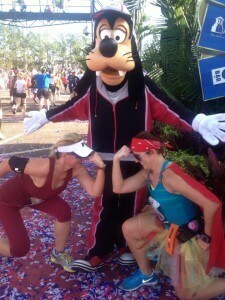 We finished the Goofy's Race and a Half Challenge with pictures and pride! It was awesome and I don't think I've ever done anything harder than this. From the training to the race this was second only to Logan's labor. I'm doing it again next year! Post-race I've got one toenail that is really damaged. There are several small blisters that don't hurt but a few toenails that will go on my right foot. My ankles are very sore from the start and stop from the walkers on Saturday and my shins are little tender. Other than that I feel really good. This was only my second marathon and I feel 100% better than my first one. Before I close out the Goofy's Race and a Half Challenge report I want to thank a few people. Chris and Logan for being there. Even though they didn't come to the race finish, just having them with me this weekend meant everything. It kept my mind off the race. I enjoyed watching Logan having a good time, relaxing, and just talking to him about the things that goes on his head. We get so caught up in busy Crabbie life that we often miss out on just being a family. This vacation made me appreciate my family more and the time we need to spend together. Kathy for being my race companion. We've done so much together now that I don't know how to race without her! She inspires me, makes me think like an athlete, makes me realize how crazy we are, and is just an easy friend to have. I can't thank her enough for the good memories of 2012 and I'm glad we started 2013 with even more great ones. Jane for being our COACH. Even though you couldn't make it this year you truly were there for us. Your texts and last minute tweaks to what we were doing saved our butts. 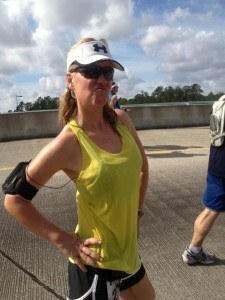 Disney for doubling or tripling the water stations during Goofy's Race and a Half Challene! I know they didn't have that many planned but they did such a good job on keeping the racers happy and SAFE. I must have drank enough Powerade and used enough Biofreeze along the route to owe them money! It made me have a Magic Day. Awesome recap. Thanks for the shout out. I hated not being there, but am excited that you are both IN for next year and can’t wait to experience it with y’all! And you can channel your inner “C” and help me with the details – ha! 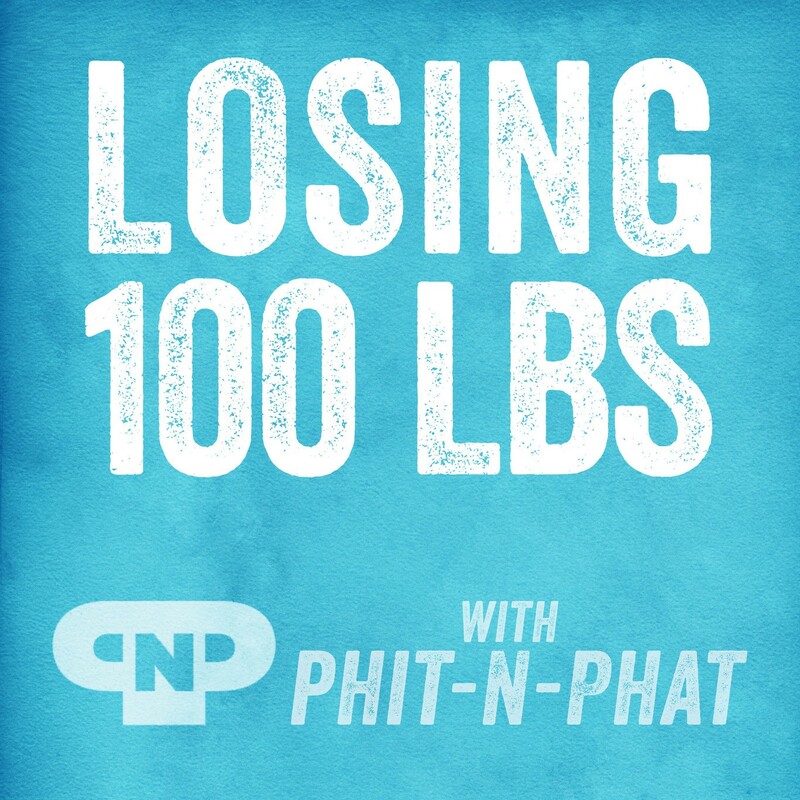 Congrats to you for such an amazing accomplishment! 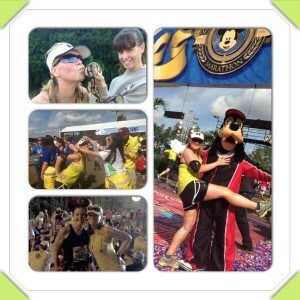 If you are running Goofy in 2014, maybe I’ll see you there as I will be running it also! I ran Goofy in 2008 and fell in love with the whole Disney thing! Actually, I am really pushing to run both Goofy (in Disney World) and Dumbo (in Disneyland) next year! I feel it’s a good way to celebrate turning 40! I did love it, Heather. I would like to do the Coast to Coast. That would also be awesome! WOW!!! What an amazing accomplishment. I loved reading about your experience as always, Corinne. It made me think about our 1st marathon, what a moment it was, I will NEVER forget as we approached the finish line the waving to the crowd, the cheers, the tears, the “WOW, I really did this moment” and going hand in hand through the finish line. Brings tears of joy to my eyes. So proud of you for completing yet another “never thought I’d do that” event. Enjoy your moment. Dawn…I thought a lot about our first marathon all weekend. Do you remember our finish time by chance? I cannot remember it for sure. I was thinking it was 6:30 hours but not 100% sure. I am so proud of both moments. The marathon is such a test of your inner strength. 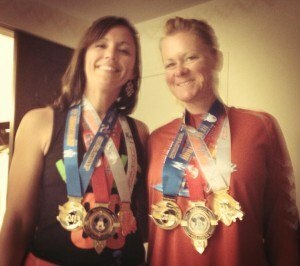 Sure it’s hard on the body but I think we proved that we can do just about anything to finish training for Little Rock. I know I have often drawn on that thought when tackling new things like Tough Mudders and Goofy. Girl, we’ve done a lot together! I’m so proud of both you and Kathy!!! Thanks girl. I felt all of PNP Nation behind us during that race and it took all y’alls prayers and good wishes to get us across both finish lines.